Just regular folks. : old skool. Jeremy is doing a presentation in which he makes and analogy about how far telecommunications has come in the past 50 years vs the innovation of the car engine. 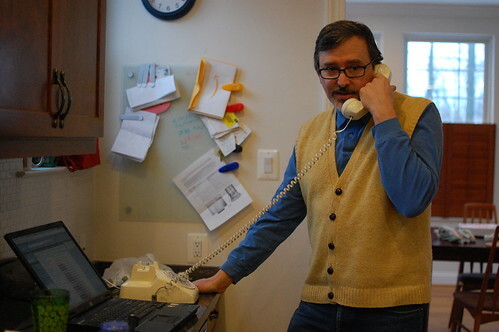 While we were at my parents' house celebrating Chinese New Year, he borrowed an old rotary phone from my parents to use as a prop in his presentation - I think it's the one I used to call all my girlfriends in high school. I think most people in the late 90s had moved on to those press-button princess phones, but my family, we are old skool. We still have a land line going to the house, although I'm not sure I should call it a land line as it is an internet phone. 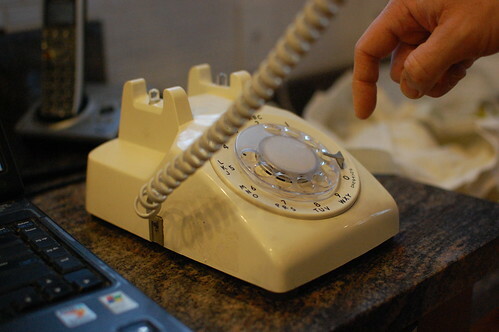 I was totally sure that the rotary phone would not work on the house line, because I figured if you are with it enough to set up an internet phone line, I figured they would know you probably would have upgraded from the rotary phone. But lo and behold! Jeremy called our cell phone from the rotary phone no problem. He asked how the sound quality was, I told him he sounded like he was from 1985. Too much Internet is even worst than TV, I think.